First, let's congratulate the numerous people who have participated in the creative design aspect of our Renaissance set (http://forums.mtgcardsmith.com/discussion/2931/renaissance-set-creative-design) =D Thanks to you, our set has some solid basis, which means it's now time to make a billion cards out of it. In short, it's time for the design phase! - This is a top-down Renaissance set, which means this is the first and most important theme. On this plane, it is represented by the return of the muses which always bring with them inspiration and spring after a long period of dull winter. - The secondary theme of the set is emotions. There are five Grand Muses of emotions roaming this plane, and their influence strongly inspire its inhabitants. There is also a sixth corrupted Muse that makes a brief appearance in the story. - Art is vibrant under the influence of the Muses! It's also an important theme of the set as the most beautiful art pieces of this plane spontaneously come to life. - Exploration is another important theme. The plane abounds with litlle achipelagos that are as many new worlds waiting to be discovered. - The greatest minds are inspired as well, progress in science and warfare is another important theme. - Feel free to use any other little theme from Renaissance: humanism, religion, royalty, etc. The main mechanical theme is life-matters. This of this theme as the graveyard-matters theme in Amonkhet, it's important and gameplay defining, but not all cards are focused on the main mechanical theme. There are four keyworded mechanics in the set: Psylian life is a new type of life representing the inspiration brought to the plane's inhabitants, Rebirth shows how this is a time of changes, Compose represents how beautiful art pieces are ensouled with life by the plane itself, and Discover represents how explorers and inventors make exciting new findings in their respective domains. Welcome to the plane of Rezatta which lives at the rythm of the muses cycle! At times it's a quite plane cloaked in a dull winter, but when the Muses return, they bring a spring full of inspiration for everyone. For some, it means creating art so beautiful it spontaneously comes to life. For others it means discovering new worlds or making huge scientific progress. But there are also tortured minds which, once inspired, just create more evil and crazy schemes. 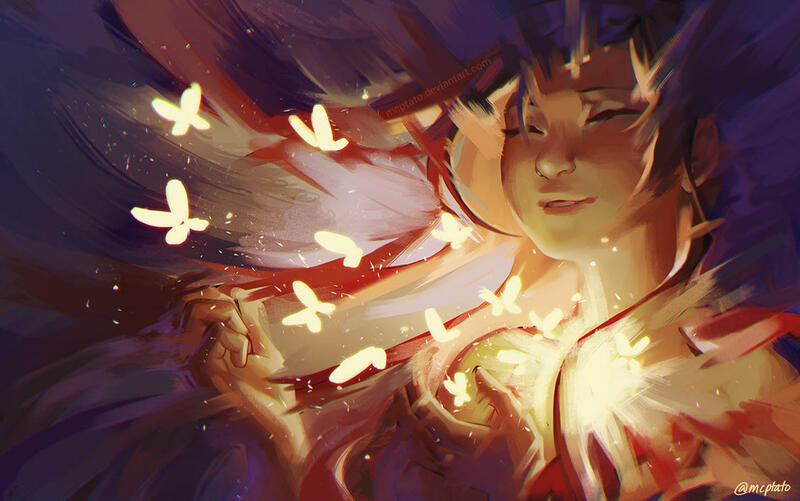 A hidden society secretly plots to steal a Grand Muse, an etheral being of emotion, to harvest its power for themselves. In parallel of showing the wonders of Rezatta under the influence of the muses, the set follows the story of five character who fail at stopping this evil organization plot. Their failure leads to accidentally corrupting a Grand Muse which kill all the other Grand Muses and goes on a rampage while twisting everyone's emotions. The five heroes will finally manage to unite and deal with the corrupted muse. But making things right will require a much greater sacrifice as they themselves become the new Grand Muses to restore the emotional balance of Rezatta. - We need cards showing what cool tricks we can do with the mechanics. - We need cards that bring the Renaissance flavour with cool tropes. - We need cards to tell the story. - We need cards that are cool in a vaccum, just to diversify the set. 1) Settling some dilemmas we still have about creative design. For instance, try to play a bit with the mechanics. What if instead of Compose N, you did Virtuoso N that did the same thing but always triggered on resolving the spell? What mix of emotions give the best five Grand Muses? Maybe you'll try to use different names to "psylian life", or "Rezatta". Maybe you have some great creature types idea for our creature grid? - We need a cycle of five legendary creatures showing the Grand Muses. They each represent an emotion (maybe two? ), it's up to you to decide what sounds best. 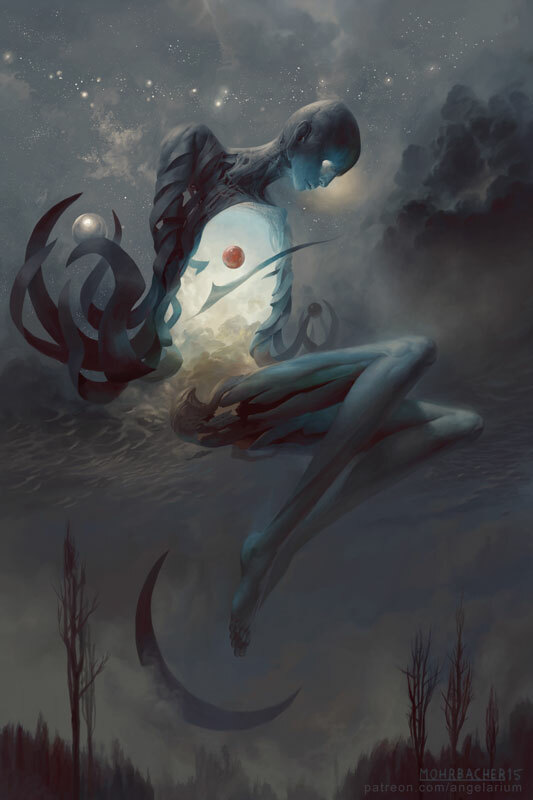 The sixth corrupted Muse may also get a card. - We need a 10-cards horizontal of uncommons that are directional towards each archetype for draft. I nominate Tibalt as walker 1. Two, he is obsessed with pain and destruction. I can see him wanting to destroy tons of art. And three, we haven't seen him since Avacyn Restored. That's a long time! Where can I find the muse art? This card both gives you the new "Psylian" life and hurts your opponent (too OP?). Maybe it should have "Psylian lifelink." I think all the muses should have a helping "Love" side and a "Hate" side to hurt your opponent. Not quite sure if this is what you were looking for with U/B, but it's certainly a thing. Muse number two - based off Erebos, Suicide Black, and "Pride goeth before a fall." If you reckon that it is too overpowered, just tell me. That link is borked, my friend. No worries. I'll give a more in-depth critique later. I really shouldn't rail on balance, though. I'm usually wrong about those things. EDIT: Just had a chance to read it, very good feedback. Will remake these cards. And do you think I should replace indestructible with hexproof? I'd say we skip the what I'll call "unfun protection" stuff altogether, and just make them really impactful creatures. Mostly because that'd help to differentiate from the gods. So just nothing, no hexproof, no indestructible. I can do that. - Super strong death trigger that makes your opponent wants to deal with it without killing it. - Having a strong ETB trigger. - Having a good "end of turn" trigger so it's repeatable and happens the turn where you play it. @ningyounk I like the protection, though I am trying to revise my Muses to have one upkeep ability that helps you and one static that hurts your opponent. @TezzeretofCarmot21, we want to keep the Muses as different from Gods as possible. Indestructible and the slew of other keywords are very reminiscent of Theros' and Amonkhet's dieties. 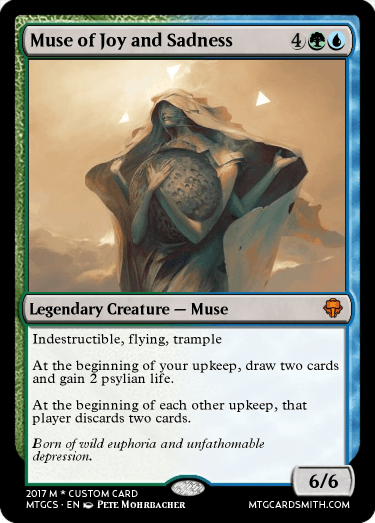 @ningyounk, I like the pseudo-Rebirth depicted on your second Muse of Pride and Shame. The first one, however, I'm not so crazy about. Personally, I think the Muses should be less creature-relevant and have more to do with life totals and the other noncreature aspects of Magic (i.e. hand, library, noncreature spells, etc. ), for two reasons: First, they induce emotion and are incorporeal, extraplanar mystical beings, so I think creating creatures doesn't make sense. And second, I think separating the Muses from creature-creation and combat will help prevent them seeming to be gods. 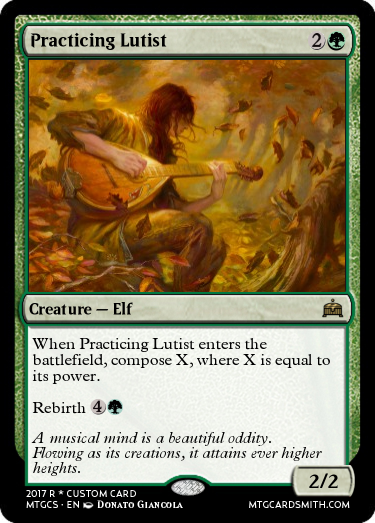 Also, Virtuoso (tentatively Compose) has the "sacrifice it at the beginning of your next end step" thing, which isn't in the mechanic on the front page or the token. Did I miss something, or is it just a mistake? (essentially) weren't creatures until a certain condition was met. These Muses are valuable mostly because they're big creatures, and secondarily because of their abilities, which are the important things, since they pertain to the flavor. Is "Rebirth" present in all colors? @Faiths_Guide, good question. We haven't really discussed this. I would guess mostly in green, white, and black, but I'm not sure. @ningyounk, any clarification? @Everyone, I just began working on some of the defining bicolored uncommons. What do you think? I have two different versions here. Additionally, will thieving Rogues (and perhaps Dack Fayden) be making appearances? I scanned over the concept of the set and an effect like this: https://mtgcardsmith.com/view/scripting-ward seems like something the set could use with the BW lifegain/lifeloss theme. The variable could be changed but I wanted to show concept of the card. @NokiSkaur So sorry it took me so long to get to the feedback on your Merfolk Rogue, I just had too many stuff happening all at once ^^" We only have one slot for gold uncommon UB so it needs to be very directional. I think this leads you to think there's either an artifact or psylian life archetype in UB instead of the Rogue one. Also 7 psylian life is probably too expensive for an effect. As it's a very strong mechanic that has the potential to go off-track, we'll try to make sure players who play psylian life usually have between none and four at any given time but rarely more. For Virtuoso, yes I proposed it at the same time than I proposed that psylian life would only make colorless mana. The change to a floating ability saves some words and make the tokens cleaner ^^ If you think it's confusing we could go back, but I don't think it changes how well the mechanic reads. Love the art and flavour of Aristocratic Aven, it's clean and is directional enough, it fits really well the archetype ^^ I'd say it's a very strong candidate. The details of the exact stats and cost will depend on the rest of the cards in the cycle and in the archetype. This is the kind of design that can go up or down pretty easily depending on what is missing to make the archetype better. @Faiths_Guide The idea for now is to have all mechanics in all colours, with each mechanic more focused on one colour combination for support (WB Psylian life, GW Rebirth, UR Virtuoso, GU Discover.) Then depending on the designs we get during this early phase of design, we'll likely remove some of the mechanics from certain colours. @Faiths_Guide Super cool cards! 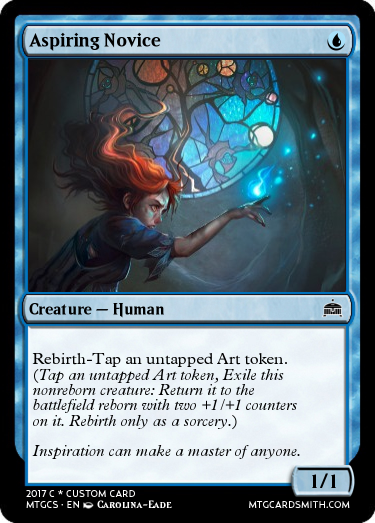 I like your original costing on the blue common, it fits the UR archetype very well ^^ Mixing Rebirth and Compose on the same card sounds a bit complex but it's definitely a fun way to use the mechanic. Maybe creating the token instead of composing it could be an option if the card costed one more mana? @ningyounk @MagicChess I'm trying to give the Muses a rebirth effect - for Pride and Shame it's "Whenever an opponent gains psylian life." I'm stuck on Trust and Doubt tho. Have any ideas? And for walkers I nominate red Tibalt and blue Dack. We ought to make Artist and Musician subtypes.